Built by Oceanfast, MY “Eendracht”, is simply a stunning vessel. At 120 feet in length and powered by MTU diesels and Perkins generators, she is one of the finest Motor Yachts in the world today. 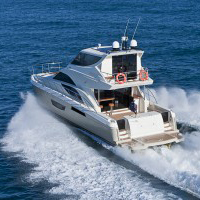 Her new owner required better performance from both main engine and generator exhaust systems. Foreshore Marine Exhaust designed a new generator exhaust system and modified the old Centek mufflers to deliver premium noise attenuation. The main engine mufflers also had some open heart surgery. We removed the bases of the Centek mufflers and added new internal baffles. The results have been, to say the least, outstanding. Foreshore Marine Exhaust have proven they are world leaders in innovation, again. Our competitors supply the same mufflers for all marine engines. Our mufflers are designed FOR EACH APPLICATION. Experience is key, without that, delivering a solution to a highly technical problem, is impossible. We are the first company worldwide, to fit internal baffles into our Waterlift and Waterlock mufflers. We have modified all of our competitors mufflers, with our sytems, to prove a point, you cannot beat experience.